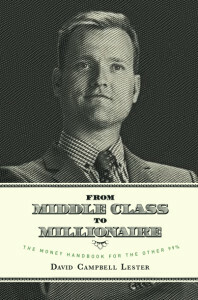 My new book from Middle Class to Millionaire is almost ready! I’ve been working here from Barcelona approving final drafts and the Ah-mazing cover design that my friend Niall Kelly worked so diligently on. My first book was how I had a positive belief system and love for money that had a beneficial effect on my life. I was able to travel all over the world, live in cool places, spend time with my family and do the things that made me happy. I’m now writing to show how the middle class can take on the same positive belief system around money and finances and increase their overall happiness and success. 1. Pensions: How to build that nest egg and figure out the alphabet soup of investment accounts and what to buy in them! 2. Property: With Canadian housing going through the roof, how can everyday families still afford to buy a place and own. It’s always been the ambition of thousands to own a place. 3. Perspective: Being Middle Class use to be the bomb. Everyone hoped to do better than their parents and worked hard to be awesome. Less and less of us think that we’ll do better than our parents and we have to do something to change that. Long live the Middle Class! 4. Pennies: They are all gone now but we still need to watch them. Learn how to make our money go farther. A penny saved on something we didn’t really want will pay “pounds” on living our best life. Pre-buy my book today from my blog and I’ll be sure to sign each one that goes out. It’ll be hot off the press in 6 weeks. Being a millionaire is something we all have to become. Let’s all go from Middle Class to Millionaire!